Marvel is getting political. Or at least having some fun with the current presidential race. 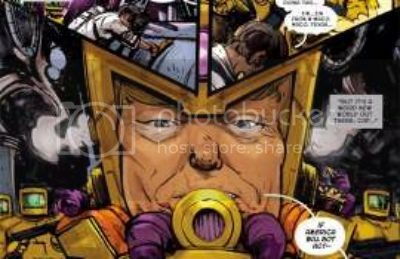 In the new issue of "Spider-Gwen Annual #1," the Republican presumptive presidential nominee Donald Trump is depicted as the villain M.O.D.A.A.K., which stands for Mental Organism Designed As America's King. "Spider-Gwen" is set in an alternate universe in which Peter Parker's first girlfriend, Gwen Stacy, is the one bitten by a radioactive spider, transforming her into the superhero Spider-Woman. The new issue features the Trump-like M.O.D.A.A.K. calling some characters of color "foreign filth," according to ComicBook.com. In this comics universe, Captain America defeats the villain by smashing his helmet with her shield, while the retired Cap narrates that "it's a weird new world out there... This nation's anger and greed and fear are still very real." I'll believe this is "having some fun" when I see a similar comic book about Hilliary. The media is trying to do their part as well. Today I see they claimed Trump did something racist! Sounds serious! He re-tweeted something, created by a comedian, that had a star of David shape on it. That was racist ...by their definition at least. Enough to make a nationwide story at least. Their shallow world has gone mad! 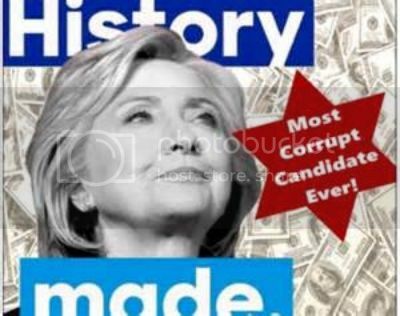 Supposedly it suggests anti-Semitism on Trump's part, though I have no idea why since Hilliary is not Jewish. It is also said to come from a comedian's website or some white supremacist web site. The Trump people later removed this image and replaced it with a simple circle which I am not sure was a good idea. He could have left it as is and told people it's just an image, like a sheriff's badge, and to quit giving it meaning it does not possess. However, if he had done that, he would probably be beat over the head with the charge of anti-Semitism for ever and ever. Trump has got to be more careful. Hilliary could make a speech praising ISIS and the MSM would ignore it or alibi it. Everything Trump does is minutely analyzed and exploited for negative political effect, if possible. He must be, as far as is possible, like Caesar's wife, "above any suspicion" (of anything). No one, btw, is noting the content of the image, namely that Hilliary is totally corrupt and can be bought. BOOM: Donald Trump Announces 5-Point Plan about ILLEGAL IMMIGRATION!